SEO stands for search engine optimization. Search engines like Google show several types of search results to their users. There are paid ads, local results and organic results. You want to make sure to your business shows up in all three areas if possible. 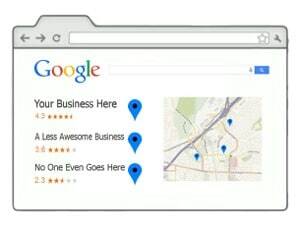 Local SEO is optimizing your website so that it shows up in the local results. You can view an example here. Local SEO can also include organic results if you are targeting a specific location on your website. If you are a brick and mortar business with one or more physical locations or a service area business, then local SEO is right for you. Otherwise, if you’re an online business or are looking to rank nationally, then SEO might be better for you. I also offer White Label SEO Services for digital agencies. Pigzilla can help you to rank locally. One of the ways I do this is by managing and optimizing your Google My Business listing. If you are looking to rank in different locations, it’s important to perform optimizations on your website such as using location terms in your pages titles, page content and headings. You will most likely need to create new pages on your site as well. It’s important to build locally relevant links to your website, manage your citations and grow your online reviews. We can help you with this as well.